Who would you believe when it comes to golf advice, me or Corey Pavin? When it comes to golf I think my resume is pretty good – I broke 90 a few times and I’ve meet Jack Nicklaus. I’ll grant you Corey Pavin has more room to boast — 1995 U.S. Open Champion and top five finisher in The Masters, The PGA Championship and The British Open. But should that really make a difference? Here’s the scoop. My wife Jane is BIG time into golf. I joke with people and say the only difference between her and Tiger Woods is nine holes a week…and a really big paycheck! Several years ago I shared something with her that I often share in sales training when we talk about attitude and focus. That was a true statement because sometimes it’s not what you say, it’s what people hear. Why did she believe Corey Pavin and forget what I’d said? Because he was an authority, a recognized expert when it comes to golf and I’m not. He and I can say the same thing but people will believe him more because of who he is and what he’s accomplished. Have you ever come up with an idea and seen it fall flat but then someone else shares it and it’s a success? Don’t feel bad because it happens all the time in business and at home. Sometimes we have to swallow our pride and recognize the idea or message will be received better if it comes from someone else. I believe what goes around comes around and you’ll eventually be recognized for your good ideas and advice but it can take time. Parents, you can tell your kids to eat their veggies all you want but if Lebron James, Tiger Woods or Tom Brady tells them to eat their veggies, who do you think they’ll listen to more? The sports figures of course. When our daughter Abigail was little she was a fussy eater like most kids. We could ask her, tell her or threaten her to eat all her food to no avail. But she was always good at the doctor’s office so Jane used to tell her she had the doctor on the phone and he said she better eat all her dinner…and bang, the plate was clean! He was an authority, the doctor, and she knew to listen to him. Now that Abigail is older and works out with her mom I knew she might not work as hard as she should so I got in touch with an ex-Ohio State football player at the gym. I asked him to have a talk with Abigail and he did so the first day she went to the gym. She sometimes doesn’t listen to mom but she listens to him because he’s an authority in her eyes. I think you get the point. Sometimes to get what you want you’ll be better off to let the message come from another. In future posts we’ll talk about how to enhance your authority so you won’t have to turn to others. P.S. 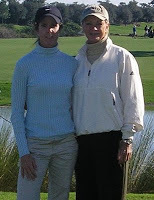 Now when I want something I start with “Jane, Corey Pavin says…” Sometimes it works but I think Jane’s on to me. Influencers from Around the World - Could Shakespeare give Women Career Advice? Are You a Twitter Snob? My Best Parenting Advice Ever!